This is authentic guacamole. If you already know how to make this, tune out now. If you don’t, then make it and be converted forever. It’s more of a chunky salad than a dip, with surprises in texture and flavour through the chunks of avocado and pieces of juicy sweet tomato. Enjoy with some home made tortilla chips! Great lunch and so very good for you. Dice the tomato and eschallot very finely. Chop the coriander roughly. Set aside. Halve, de-stone and peel the avocados. Roughly mash with a fork. Stir in the chopped ingredients, the cumin and squeeze in the juice of one lime. Season with a pinch of salt. 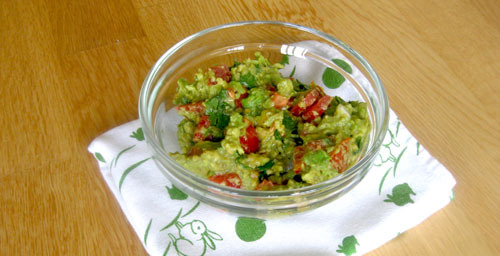 Taste the guacamole and adjust the acidity and saltiness to your preference. Everything should sing in harmony, rather than one flavour dominating. I have seen some people add a chopped red jalapeno chilli, but I don’t think it’s necessary. I tend to whip in a decent drizzle of olive oil to fluff it up a bit as it’s incredibly hard to get properly ripe avocados not but for two weeks in a year. You can also use mayonnaise in small amount to cheat the effect as well. Thanks Mrs delicious, Now I know what cilantro means in English !